This is probably the shortest–and yet, probably my favorite–blog post you’ll likely see on this blog. In what has become sort of an informal tradition, I like to take every 100th post or so and give back in some way, whether it’s to the Asperger’s/autism spectrum community, the blogging community, or both. I absolutely love that y’all interact with each other and hang out here; it’s a total pleasure and honor to have y’all in my life. Seriously, I mean that much more intensely than words afford me the ability to say. So… I’ll shut up now (soon), and invite y’all to sound off in the comments, with links to your blog(s), your favorite post(s), links to your books (whether they’ve been out for a while, or are newly-published, or are soon-to-be-published), whatever you like. I have no “rules” at this point, because I do have the honor of having y’all as friends and spirit-family and my regard for you is that high. Man, I’d love to “promote myself” but I’m scared to. I’m sure you understand why. Hi all, I blog at aspiblog.wordpress.com and also run a London transport themed website http://www.londontu.be. I choose not recommend any particular posts, leaving you to do your own exploring. almost anyone can figure out how to get to my blog from here– nonetheless, id encourage anyone reading this to learn how to code. coding is as difficult (or easy) as the language makes it. if the language is difficult, all the friendly point-and-click will only disguise the difficult. if the language is easy, you can type it. My site is a food and travel blog. Also my husband wrote a book called “Andrewtism” . It was self published about 5 years ago and can be found on Smashwords as an ebook. It’s our fanily story raising a son w Autism from a dad’s perspective. Cheers! Happy reading and writing everyone. I read lots more blogs than I follow – maybe I should do more following! I’ve left quite a few comments and have had such lovely responses. For some reason I find “socialising” on the internet every bit as difficult and nerve-wracking as IRL, but everyone I’ve been in contact with has been super nice. 🙂 I’m kind of standing at the door of the autistic internet community, unsure if I can come in or not, but I get so much out of reading all your blogs that I’ve been inspired to start blogging myself (my name is the link). I totally agree, it can be pretty nerve-wracking sometimes (“did I say that right? Did I add enough smileys to be clear that I’m joking around?”, etc) 😉. Oh no, it didn’t work! Funny, it worked in my previous comment…oh well. You have set a wonderful standard and will be missed. You’ll be back. Whew, we are so happy to hear this. Thank you for clarifying this for me. We were learning so much from you and then to read and interpret it as you were letting it go was a bit sad. So thankful you are staying to teach us from an insiders perspective. Awesome. We’ll grow old together, lol. Btw, anyone can feel free to pitch in btw! I’m thinking about starting some kind of group / organisation / network a for Autistics / Aspies in Sweden. We don’t really have one. We have two national expert & autism parents organisation, otherwise it’s just small groups all over the country and… I don’t really like them, even if I’m part of one? Sweden hasn’t gotten very far in disability rights, not even the groups made by and for people on the spectrum seem to be kinda anti-label (unless it’s about function labels, which they love), and unaware of both neurodiversity & the social model of disability. This just isn’t progressive enough for me (or.. at all), and I’d like an organisation that’s pro-diversity & disability rights. But there are a lot of autistic people in Sweden that ID as such, but at the same time avoid these organisations because we don’t feel welcome and really aren’t interested in what the current ones have to offer. I really think Sweden would benefit from having one. Swedish autistics & otherwise disabled people if nothing else. I’d also kinda get something out of all my years at uni, communication, pr, linguistics, the humanities, discourse etc. Problems are of course my really low energy & general passivity and that all the cool IFL autistics live far away from me. To prove that I’m unsuitable for what I’ve written above, here is my blog https://asymmetra.wordpress.com where I write about autism, intersectionality and other things that I find important. Since it’s April I’ve committed myself to only publishing posts celebrating autism. Congrats on the milestone! I love your blog, though I don’t always have the time to comment on everything I read (and sometimes I don’t because I hate typing long responses on my phone and then forget to comment when I’m on my laptop). I always look forward to your posts. Thank you for your supportive and lovely words, my friend!! I know exactly what you mean about long responses; you’re always welcome to type them, but I know it can be cumbersome. I often use the WP app, which crashes on me several times a day, always when leaving comments, and of course it eats my comment (grrrrrrr!) lol. I’d like to put forward my blog and eBook! Featuring five women with Aspergers who’ve experienced Autistic Burn Out. This includes Autistic regression, and becoming non functioning in everyday life. It helps the algorithams – more people will see it, the more reviews it gets. I forgot to say that Raina who brings you this fantastic blog is one of the women who shares her experiemces in the eBook! 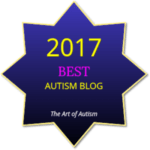 You already have it on your Resources page, but I’ll put a plug in here as well for the Actually Autistic Blogs List.